Every year, the auto world descends on Detroit for the North American International Auto Show (NAIAS), commonly referred to as the Detroit Auto Show, to see the future. In a world increasingly focused on the future of personal transportation, cars have become a staple of other large shows, most notably CES. This has led some to question whether the Detroit Auto Show is even necessary in today’s world. It’s a valid question, but the fact remains that Detroit is still the car capital of the world, and what happens in the Motor City is extremely relevant to the future of the industry. Other shows will tout incredible tech, but the Detroit Auto Show is where you need to be to hear folks discuss cars. Really talk about them. Horsepower, ride, driving capability, all the metrics car fanatics obsess over. That’s what the Detroit Auto Show is for. It’s also a place, still a place, for companies to show the world a glimpse of what their personal futures might be. Often that comes via concept cars, beautiful, sometimes absurd, models that may never see the light of day but can hold key secrets to the kind of vehicles we’ll see in the next decade. This year’s NAIAS was filled with intriguing concept cars, and these are the coolest of the bunch. A more traditional concept, meaning there isn’t an incredibly futuristic design or expensive tech, the Titan Warrior is Nissan’s vision for a new look it calls “modern armor.” An apt description as the concept truck looks fit for a war zone, but the look isn’t singular. It’s easy to imagine this 390-horsepower behemoth barreling down the road from a construction site. The look provides impressive flair, a feature often missing from this subset of trucks. Whether Nissan decides to put this monster into production is, of course, a mystery. If it did, though, the Ford Super Duty and Chevy Silverado 1500 would have to reconsider their aesthetic games. Known primarily for its line of economy sedans, Kia will look to diversify its portfolio in the next few years. The Detroit Auto Show saw an example of that diversification with the Telluride concept, a three-row, seven passenger SUV that is brimming with technology. The car harkens an older era of SUVs with its boxy stylings and upright stature. It has a dominating front-end that exudes power, and concept-standard suicide doors. Inside, the Telluride has an impressive list of tech at work. The front captain seats each feature a “Smart Sensor” that reads occupants’ vitals and displays them on a screen on the interior door panel. The second row has Swipe Command, a control system that allows users to swipe across a touch-sensitive band on the center console. The concept’s traditional stats aren’t too shabby, either. The Telluride packs a hybrid powertrain that combines a 3.5-liter, 270-horsepower V6 and a 130-horsepower electric motor for a total 400hp. Hydrogen-powered vehicles have long been thought of as a possible solution to the fossil fuel dependency the auto industry has operated within for much of its history and now they are closer than ever to becoming a reality. Audi’s h-tron quattro proves that. Besides displaying the possibilities of fuel cell technology, the concept SUV comes with an impressive 372-mile range (on a single tank of hydrogen), the ability to go 0-60mph in less than 7 seconds and a refueling time of just four minutes. Like many concept cars, the h-tron quattro also features a glimpse at future technologies Audi will include in other production vehicles. Chief among them are the company’s piloted driving and parking technologies, which hinges on what Audi calls the “central driver assistance controller.” The controller is a device that computes a model of the car’s surroundings in real-time, making the information available to the piloted driving and parking systems that work similarly to Tesla’s Autopilot. The features are expected to first see the road in 2017 with Audi’s next generation A8 full-size sedan. The hydrogen SUV also includes curved OLED touchscreen displays on the interior, furthering the notion that your dashboard is going to get a lot more hi-tech in the next few years. The Precision Concept is a design study for the future of Acura. Nearly everything found on the car’s striking exterior can’t be seen on the road today in the company’s current lineup of nice, but stale, vehicles. It’s far bolder than the automaker has displayed a liking for in the past, which is what makes the Precision Concept so interesting, and needed. Few car companies need a refresh as badly as Acura, and the debut of the aggressive concept car in Detroit this year is a sign the company is aware of its image problem. The Precision Concept is a tease, Acura’s feature models are almost guaranteed to include some of the design language premiered with the concept, meaning the company’s fleet could be a lot more eye-catching in the next decade. Like Acura, Buick is in the midst of attempting a brand revitalization, evidenced by the company’s current marketing campaign. Unlike its current vehicles, which still skew dangerously conservative, the Avista is a gorgeous shot of modernity. The car is built on the same platform as the new Chevy Camaro and features an impressive 400hp thanks to its twin-turbo V6. The car is primarily about looks, though, and it can’t be said enough: the Avista is stunning. It is an elegantly designed car that can stand toe-to-toe with some of the best luxury coupes on the road today. Perhaps even more impressive, in today’s world of leaks upon leaks, the Avista was a complete surprise. 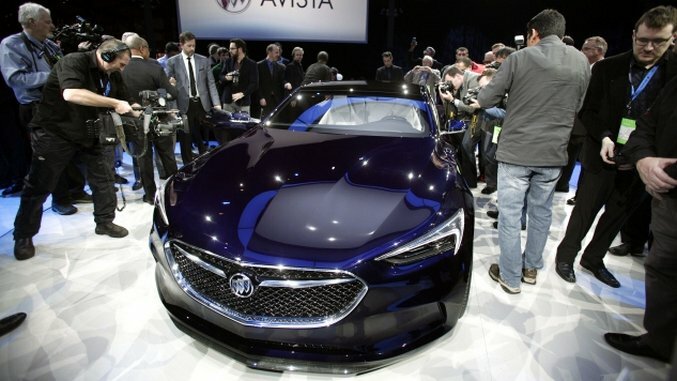 No one saw a stylish coupe from Buick coming, but most were elated it arrived. Buick would be smart to put it into production, though the word thus far is that they are unlikely to do so.